It’s too late to grab ketchup for your portfolio now that Warren Buffett has taken the biggest player, Heinz, off the shelf with a record $23 billion acquisition. But it’s not too late to catch yogurt as it becomes the first real new consumer staple to emerge in decades.Buffett himself is not likely to develop an affinity for yogurt as he did for ketchup, but there’s a similarity between the rise of the two foods that analysts say could be setting up a profitable run for the dairy case staple. Like the slow pouring Heinz, it’s the thickening agent that turned the relatively specialised small category of yogurt into a consumer product colossus that might appeal to investors who like to bet on earlier-stage growth. S&P Capital IQ says in a report this week that it expects yogurt to take a growing share of overall consumer food purchases. S&P analyst Todd Rosenbluth says yogurt has a Buffett-like appeal as a stable demand consumer product where brand loyalty is already strong. The question for investors is which brand to bet on. To continue the ketchup comparison: The deal to buy Heinz is the largest food acquisition ever, and follows the pattern of all the Buffett deals. Heinz sells an affordable product and is a “category killer” that is so strong it discourages new entries. Its flagship ketchup has 59 per cent of the U.S. market and about 30 per cent of the global sales, though ketchup is largely an American condiment. Heinz literally invented the category by putting a thickening agent into a much more watery tomato sauce to make it pour sslloooowwwwwly. The same thing is happening in yogurt, which has been sold as a healthy snack for years but only really hit the status of a multi-billion dollar staple category in recent years thanks to the soaring popularity of thicker, Greek-style yogurt. It’s thicker and creamier than past products, and provides more protein in a lower calorie package. So how do you invest? Unlike Heinz, Greek yogurt is a product that a number of companies are vying to sell in hopes of becoming the leader in this fast-emerging market. There is no telling when or whether that will happen. But Greek yogurt as a category looks like its here to stay. For now the competition is giving a boost to the category. “All in all, yogurt is becoming big business, ” S&P says. The closest anyone comes to being the Heinz of yogurt is privately held Chobani from upstate New York. 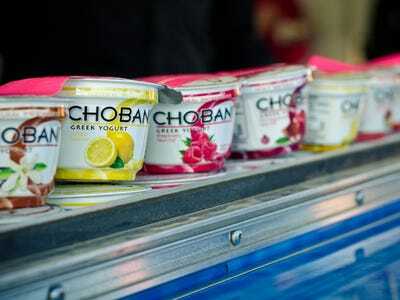 There is talk that Chobani will launch an initial public offering soon, after a run of remarkable growth that carried it from zero sales in 2007 to its present $1 billion level, hitting that milestone faster than any new supermarket product in history. In a recent Reuters interview, the company has said it won’t rule out an IPO but does not want to be bought by anyone else. So what’s the appeal of such a hum-drum consumer product now? “It’s a ketchup-style product that’s becoming an increasing part of consumers’ diets and a staple item for people,” he says. It’s also a product that appears able to sell steadily even in a bad economy, says S&P in its report “Stock Up On Yogurt.” In a decade marked by a major recession, yogurt sales have doubled, retail researcher NPD Group reports. Buffett’s Berkshire Hathaway often invests in food and beverage companies with the potential to keep generating sales and profit through all economic cycles. “Buffett invests for the long haul and with Heinz he is looking out ahead and seeing there is going to be inflation in foods. It is a company that sells a staple item for which they will be able to increase prices,” says Mark Germain, chief executive officer of Beacon Wealth Management. That’s been the broad case for consumer goods stocks for the past few years. Consumers always need foods and detergents, and their brand marketing helps them survive in hard times that test customer loyalty. Ideally, when the economy is weak customers don’t defect to cheaper non-brands, and when inflation hits, they pay for prices increases. For years, Buffett’s Berkshire Hathaway has managed far above average returns from buying and holding the stock of such companies.